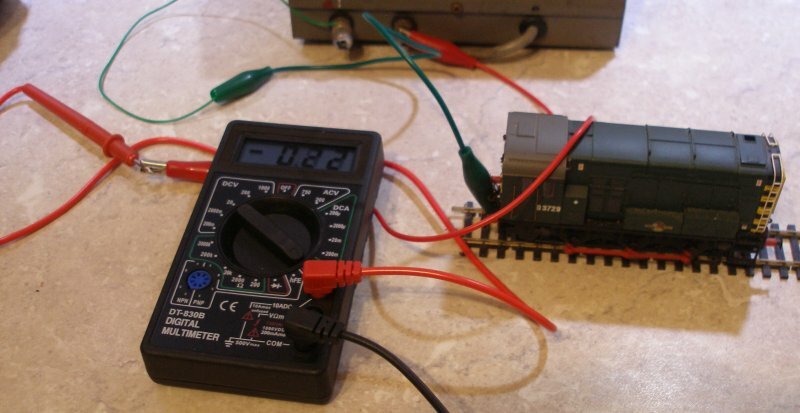 How do you find the stall current of a model locomotive? Some three years into the DCC game I have been lucky in that all the decoders I have bought, after a bit of swapping around, have found a loco that suits them. But the inadvertent acquisition of a 0.5 Amp chip brought about the realisation that I had no idea what the stall current was for the remaining unchipped locos, or indeed, how to find what is was. Essentially the chip being installed should have a higher rating than the locos stall current. So I have stumped up the princely sum of £4.08 for a digital ammeter off eBay. The test is easily completed. Using a DC controller (I still have one for the workbench), clip one lead to a rail on the test track. Plug the leads into the ammeter as shown in the booklet accompanying the ammeter, and attach the other power lead from the controller to the red lead. Place the loco on the test track, turn the controller on, and place the black probe against the other rail (out of sight to the right in the photo below). The loco will run, and then is pressed down on the track so that it's wheels stop turning briefly. This does need to literally be brief, as if held too long, there is a risk of burning the motor out. The Bachmann 08 in the photo is actually running, having arrived at the green crocodile clip. With its wheels slipping, it is drawing 0.22 Amps as shown on the display. I bought the laisdcc 0.5 Amp decoder in error, and found that in the locos I tried it in, it ran very badly indeed. With hindsight, it can be seen that the first two locos I tested it in were the worst possible ones, being the Heljan 33 and Hornby Railraod 9F. According to the table above, the chip is not actually suitable for any of the locos available for testing. However by 'trial-and-error' I found that it worked in the Hornby (ex-Lima) Class 101 DMU, although technically this is also above the 0.5 Amp maximum. So for 4mm modellers it is difficult to see what practical value the 0.5 Amp decoders have. Indeed, the table makes interesting reading with the older models at the top of the table, along with the Heljan. The Kitmaster power bogie could be bought as either a power bogie to motorise the Brake 2nd coach (and so push the Kitmaster unmotored loco) and the Blue Pullman, or as a powered 4-wheel goods van! Remarkably, it still runs very well with no maintenance for a good 50 years! The Hornby 9F tender drive is the very original 'Evening Star', with six flanged wheels on the tender. The Class 20 is the original Hornby Dublo Type 1 diesel, which has a single power bogie with traction tyres. Remarkably, this old Meccano soldier also runs surprisingly well after many years of non-use!